Portable label maker can be used as a stand-alone or connect via USB to your PC or Mac. 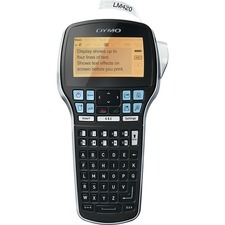 Plug-and-play software allows you to plug in, type and print labels immediately. Label maker requires no software installation. Print labels on 1/4", 3/8", 1/2" and 3/4" Dymo D1 labels. Store up to 15 labels. Large backlit graphical display shows what the label will look like and offers four lines of text with up to 18 characters. ABC keyboard has different keys for numerics. Printing tools include 268 symbols, eight fonts, seven sizes, 10 styles, six bar-code types, quick access buttons for punctuation and currency symbols. 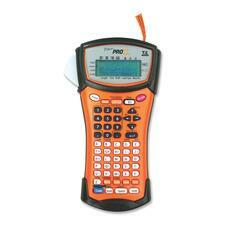 Label maker also offers mirror printing, vertical printing, repeat printing, auto numbering, and manual tape cutter. Label maker includes a rechargeable lithium-ion battery, charging adapter, starter D1 label cassette, USB cable, and quick start guide. Two-line labeler prints up to eight characters per line with a patented no-mess inking system. Larger label rolls and drop-in loading deliver increased productivity. Maximum character height on the top line is 3mm, and the bottom is 5mm. Labeler is easy to operate. Simply squeeze, release and apply. Labeler includes preloaded ink roller and label roll. Durable and rugged handheld label printer uses new flexible ID tape and rotated print for cable wrapping and flagging, industrial strength laminated tapes for patch panel labeling and standard laminated tapes for faceplate labeling. Creates labels with graphics and bar codes from 1/4" to 1" wide. Download databases, custom templates and graphics. Label printer provides memory functions to store frequently used label designs, easy entry keyboard and large display for quick editing. Includes auto sizing, sequential numbering, repeat printing and vertical style for quick labeling. Auto power off feature helps save battery life. 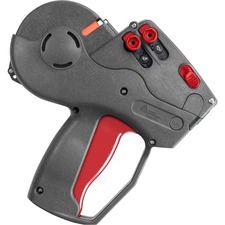 Handheld label printer is perfect for telecom/cabling, asset management, property management, manufacturing and general office use. Makes rotated, vertical and horizontal labels. 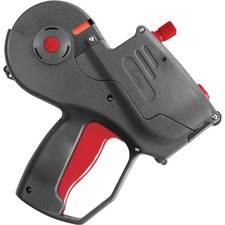 Comes with extra strength and flexible ID "TZ" tapes, tape separator, batteries and carry case. Heavy-duty aluminum embosser makes tough labeling easy. Produces 19 point high characters on 1/2" DYMO metal or vinyl embossing tapes that withstand extremes of weather, temperature and corrosion. 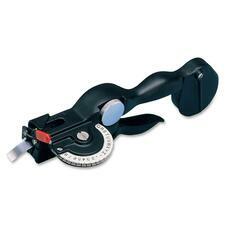 Use front scissor cut-off and built-in hole punching device to affix labels by inserting wire ties, nails or screws through the 3/32" hole. 1/2" DYMO aluminum tape (no adhesive), one roll 1/2" DYMO aluminum tape (with adhesive) and one .188" character horizontal wheel. Two-line Pricemarker 1155 prints up to 24 total characters. With up to 12 characters to print per line, you can have plenty of vital day-to-day information on your label. Use the top line to print SKU, vendor and PLU codes, track dates and other pertinent information in large, legible fonts. The 12 positions on the bottom line are ideal for printing packaging quantities such as case, box, yard and pair as well the pricing. Maximum character height is 5mm. Labeler is easy to operate. Simply squeeze, release and apply. 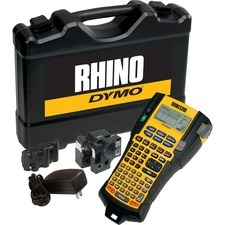 Rhino 5200 Kit lets you quickly create crystal-clear, professionally formatted labels for wires and cables, terminal blocks, 110 blocks, electrical and patch panels, shelves, racks, equipment machinery and more. Print Code 39 and Code 128 bar codes on 3/4" (19mm) labels. Rhino 5200 uses industrial-strength labels that resist extreme heat, UV rays, moisture, chemicals and solvents so your labels will stay stuck and stay legible in harsh conditions. Preprogrammed symbol library includes industry symbols, punctuation, currency and fractions. Integrated, slip-resistant grip and rubber bumper protects label maker against damage from accidental falls and rough jobsites. Integrated lanyard loop provides option of hands-free portability. Large two-line display is backlit for poorly lit installations. Label printer runs on six AA batteries (sold separately) or on lithium-ion battery (sold separately) and meets all ANSI, TIA/EIA-606-A labeling standards. Automatic shutoff maximizes battery life. Single-line pricemarker features big, easy-to-read print on contrasting, bold fluorescent labels so prices jump off your product to catch customers' attention. Create promotional labels on the spot with underscored cents, multiple prices and unit pricing, including case, box and each. Print up to $9,999.99. Print is clear and concise. Both your customers and your associates can easily read the prices, helping to speed customers through the checkout line with increased accuracy. 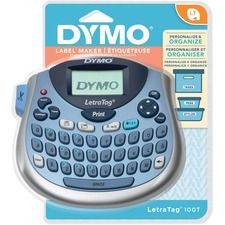 Personal Label Maker LetraTag Plus LT-100T is ideal for the home or small office. The computer keyboard design is easy to use with navigation buttons that allow quick access to advanced features like multiple font styles, text sizing, date stamping and more. Unique graphical display allows you to see bold, italic, underlined and other text effects on screen before you print. Print on a variety of labels with different applications (paper, plastic, metallic, magnetic and iron-on). 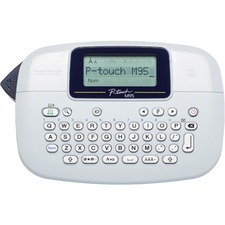 Compact label maker features a 13-character LCD screen, two-line printing, five font sizes, seven print styles, eight box styles and underline, 195 symbols, nine label memory, date stamp, auto-off power saver and three language options (English, French, Spanish). Direct thermal-print technology requires no ribbons, ink or toner cartridges. Uses 1/2" LetraTag LT Label refills. Label printer includes two 1/2" label cassettes (one paper, one plastic) and runs on four AA batteries (not included). Brother P-Touch - PT-M95 - Label Maker - Thermal Transfer - Monochrome - Labelmaker - 0.30 in/s Mono - 230 dpi - LCD Screen - Handheld - Auto Power Off All of Brother's computer connectable label printers are supplied with advanced label-printing software in the box as standard. In addition to this software, there are other professional solutions available for download, or from your local Brother office. Add the benefits of P-touch label printing directly from within your own existing software, or create your own totally customized labeling applications. By using the b-PAC SDK (Software Development Kit), your labels can contain any combination of text, barcodes, images and logos.